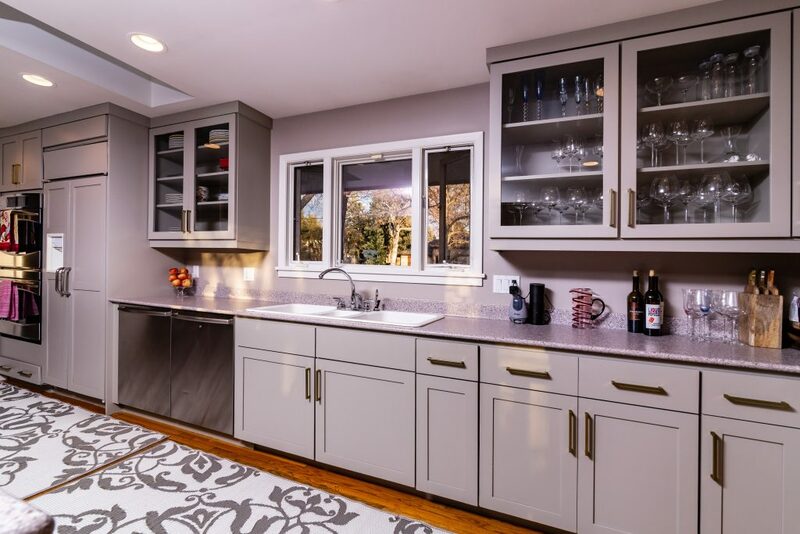 Why Are Painting Kitchen Cabinets all the Rage? About five years ago I had a revelation. “Holy cow! People are going to start wanting to paint their kitchen cabinets.” Everything I saw on Houzz.com, Pinterest, and on reality TV showcased white kitchens. Replacing or refacing kitchen cabinets is expensive but painting cabinets would be a fraction of the price for the SAME updated look. The only problem was that I hated painting kitchen cabinets. The process was hard, tedious, and impossible to get a good end result. There had to be a better way! Around the same time as my epiphany, I was helping a friend move. As we finished our last load from the moving truck, I looked around and thought, “THIS would be perfect for cabinet painting!” The box truck could be outfitted with a wall and some closet rods to hang the cabinets. After a little more research, I decided a truck was not the best idea, but a 20-foot trailer would be perfect! So in November of 2014, I bought my first trailer and built our first mobile spray booth. Fast forward to today and we have nine trailers. Customers love our trailers because we do not need to take their doors and drawers off-site, and we do not need to take over their garage, as we have previously done. Over the last two years, we have learned and perfected our process. Painting kitchen cabinets is highly technical; there is a right way and a wrong way to paint cabinets. Unfortunately, the majority of cabinets I see painted are not done the right way. 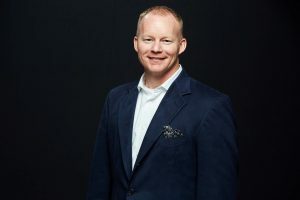 Kitchen cabinets are a household item that people use a lot, and the more they are touched, opened, and interacted with, the more opportunity there is for something to go wrong. Personally, I believe if you use an item in your home a lot, such as cabinets, it only makes sense to buy the best. That is why when we paint kitchen cabinets, we do it right. We always buff sand and de-gloss our cabinets with a very strong cleaner. This breaks down the hard finish that is currently protecting the cabinets and allows our primer coat to bite into the wood a little. Using a bonding primer will help this as well. We like to use Stix by Benjamin Moore. It is not okay to use just any old primer, all primers have a specific purpose; it is important to use the right one. Don’t even get me started on the ‘primer and paint in one’ product. TWO coats of primer are best. If the cabinets are dark, the second (and possibly the third) coat needs to be a stain blocking primer. 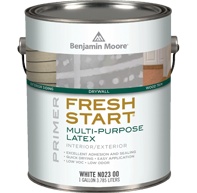 We like Fresh Start by Benjamin Moore. The next step is to paint the cabinets with a good interior trim product. We use Advance by Benjamin Moore. 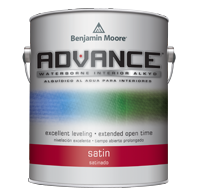 Advance is an oil modified acrylic paint that dries fast, lays down for a smooth finish, and cures hard and durable. When we are painting cabinets, we use an HVLP sprayer that is specifically designed for trim and finer finishes. It is the perfect tool for painting kitchen cabinets. This tool is not for beginners, but once you know what you are doing, it produces fantastic results. Spraying all the doors and drawer fronts allows us to get as close to a factory finish look as possible on the surfaces that are seen the most. Walls by Design has a commitment to not spraying in homes where people live, so we hand brush and roll the remaining boxes. It is good to note that two to three light coats bring the best results. The heavier it is applied, the messier it will look. 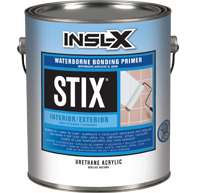 Most people think it is bad to thin paint, but it is recommended by the manufacturers to thin up to 5 or 10%. It provides less coverage, which is why a third coat is sometimes needed. Do you like the cabinet door detail? Do you like the layout of your cabinets? If the answer is no to either of those questions you should not paint but rather, replace or reface them. We have been called out to fix a lot of kitchens since we began focusing on painting cabinets. 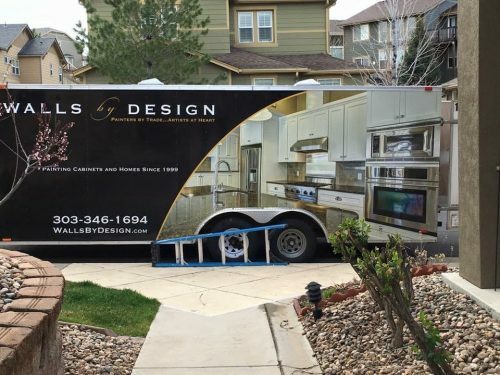 We have seen other cabinet painters’ problems like mis-matched color, pealing paint, super thin paint, over-sprayed hardware and walls, and overall poor paint jobs. These mistakes happen because cabinet painting is a bit more technical than average painting. Homeowners and contractors alike underestimate the importance of the proper prep, as well as how hard it can be to spray the doors properly. I once visited a kitchen (that I had previously estimated) and the contractor simply taped off the hardware (not well I might add) and sprayed all the doors, drawers and boxes all at once. When I asked how long it had taken the other cabinet painter, the homeowner said about a day. They had bid the project at about half of what we would have charged, but it would have taken us three days instead of one. Unfortunately, she was pretty distraught about the situation she had gotten herself into. I once visited a kitchen (that I had previously estimated) and the contractor simply taped off the hardware (not well I might add) and sprayed all the doors, drawers and boxes all at once. When I asked how long it had taken the contractor, the homeowner said about a day. They had bid the project at about half of what we would have charged, but it would have taken us three days instead of one. Unfortunately, she was pretty distraught about the situation she had gotten herself into. On another project, the contractor brushed all the surfaces, leaving brush marks everywhere, and we could still see the color of the original cabinets through the paint. The painter started with a chalk paint and later switched to Advance. The only way to fix that project is to sand down all the paint and start over with the right primer. This homeowner paid more than what we had quoted for the these poor results. Now you can see the importance of painting your cabinets right, the first time.